The Sunset Spectrum mimics a natural sunset in Red and Far-Red spectral energy. The Red to Far-Red ratio relaxes and triggers plants to sleep faster. This speeds up a chemical response which induces flowering. The Sunset Spectrum can reduce overall flowering time by 10-14 days. We know that short day plants grown outside are triggered to begin the flowering process when there are fewer hours of daylight. Scientists know specifically which processes need to occur for flowering to be accelerated and which light energy to use. Red and Far-Red energy in the light spectrum induce a chemical process that instructs a plant to flower. The chemical produced is called phytochrome, which has two versions; Phytochrome Far-Red (Pfr) and Phytochrome Red (Pr). The Pfr chemical levels increase when plants are exposed to 18 hours or more of light each day. Build-up of Pfr signals the plant to grow short stocky stems with tight internodal spacing and inhibits flowering. The Pr chemical occurs when plants are exposed to the night or far-red light energy. Build-up of Pr lowers the amount of Pfr in the plant. This triggers flowering. During the day, visible light energy, especially in the red part of the spectrum, is causing the build-up of Pfr. As night starts to fall and the sun’s spectrum shows more Far-Red light, the plants begin to fall asleep so the night time processes can start. 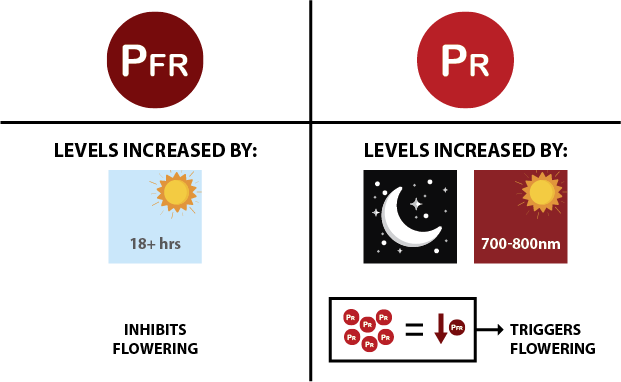 Plants will begin building up Pr because the dark of night causes a natural change that starts to lower the amount of Pfr. Mimicking sunset with artificial lighting, especially with the Far-Red part of the spectrum, will accelerate the process of flowering. As long as the plant thinks the day is long and the night is short, there will be more Pfr present, keeping the plant from flowering. As the days get shorter and the nights get longer, there will be more Pr present and less Pfr. This will allow the flowering process to begin. When lowering the indoor light cycle to 12 hours on and 12 hours off, the days become shorter which lowers the Pfr and triggers flowering. 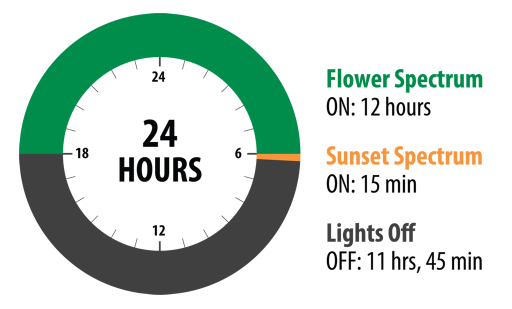 By adding the Sunset Spectrum for 15 minutes after flower spectrum has turned off, you will get the plants to sleep more quickly and accelerate the Pfr/Pr changes. Growers have seen their flowering time reduced up to 14 days when using a sunset spectrum for only 15 minutes after turning lights off for the night. Once the plants start flowering, you should not use the Sunset Spectrum setting.